Irish and proud? – My thoughts on a page. Last weekend yer man and I headed off to Prague for a few days. It was a fabulous break in a very beautiful city. A trip such as that can of course highlight the many differences between the two of us, such as my love of history and interest in castles and churches which I could spend hours looking at and reading about, compared to yer man’s interest in them which lasts a few minutes at most! Those of you who follow this page on Facebook will also be aware that while we may know the history of Prague our sense of direction isn’t great. We knew there was a famous bridge called Charles Bridge so we set off to find it. After a relatively short walk in the wrong direction we eventually sorted ourselves out and finally found it. Posing to take a few photos to mark this special moment we looked further down the river. There was another bridge in the distance, a pretty looking bridge, with a rather enormous number of people walking it. It would appear that our much photographed, less than special, rather empty bridge was not Charles Bridge after all. Ah well at least there was tomorrow. Going to a foreign city always reminds me of my Irishness, as I listen to natives speak their own language, spend foreign money and wonder will we chance some native food? 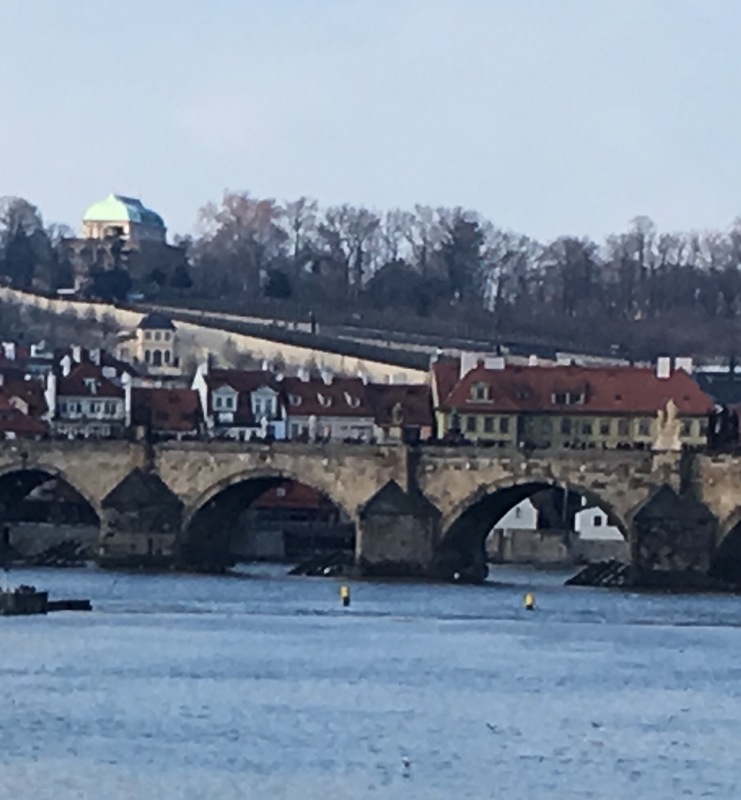 Over the few days I compared our two countries and admired the many traits I saw in those around me, gaining an insight into who the Czech’s are and what they have come through as a nation. We are home a few days now and the memories remain very clear. However, last night I was out and I found myself once again thinking of what it is to be Irish. There are many things about my country I’m not proud of, but am I proud to be Irish? We were gathered at a friends house and the food and drink was flowing. We’d met early and I’d imagined we might be home by 1.30 am. What was I thinking? 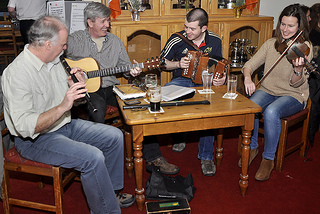 As we say here, ‘we were having great craic,’ when at 2.30 am the first song was sung. Quite a number gathered were pretty talented in the voice department and with vocal cords well lubricated a great variety of songs were belted out. One of the songs we listened to, sung by yer man, was called, ‘Sweet Kingwilliamstown.’ This was the old name for his home village, now called, Ballydesmond, and the story behind this song is very interesting. It was composed by a young man, named Donal Buckley, who left Ballydesmond as a third class passenger on board the Titanic. When the boat was sinking he smashed the gates which stood between the steerage passengers and rescue. He got himself onto a lifeboat and made it to the US. Subsequently he enlisted in the army and fought in World War One. Tragically he was the last American soldier to be killed. Sitting there listening to songs, some of which dated back over a century, and possibly mellowed by alcohol, I took a moment to feel proud and happy to be Irish. We have a wealth of history and a treasure trove of songs and poems. However, like it or not our world is changing, our culture more easily influenced by outside forces. ‘Trick or treat’ and Black Friday are now firmly embedded in our calendars. As I sat listening to those old songs and the history they spoke of I wondered if I was witnessing an ending? These songs are no longer taught in schools. Will future generations learn them? Will my children one day gather with their friends and share them with the next generation? Or will they discard them in favour of the songs of the world they now live in? Only time will tell, but as I arrived home at 4.30 am I thought… great friends, great sing song and yes, it is great to be Irish. There I am in the paper #49. When I travel I find myself more often, if not always, admiring the positives about where I am. Even though I am proud of where I am from, I can recognize faults and failures, but it doesn’t take away from the incredibleness I see in ‘every day’ people. Yes, I did see so many positives in Prague. But I’m with you. I’m happy to be Irish and of course you are too! I am biased. True story! I can’t wait to get my dna test back so I can see HOW Irish I am! 😉 Though the test won’t measure the heart of it all. Oh wow that’ll be very interesting although a terrible waste of money. I’m an old soul at heart for sure. Song and tale are in our blood and what my granda sang to me on his knee as we listened to his record player, I now sing to the twins . Yes I did the same but my little ones are grown up now and I’m not sure they feel as I once did? But maybe when they have their own they will? Yes it really is up to me to do my bit to pass it on. I think I’ll put more effort into that. Can already hear the wailing of my own kids as I ‘educate’ them. Some day they’ll thank me? I enjoyed your post Tric and its often I think of my Irish heritage and I’m proud that I have that background, I think it explains a lot about the sense of humour that permeates my family. Yes I do enjoy our humour and admire our resilience. I got on great with Aussies when I lived over there. We are such a likeable lot aren’t we…. And it’s the joy of song, and of good company and good craic, and its the sad sweet melancholy for what might be lost that make you seem so very Irish to me. 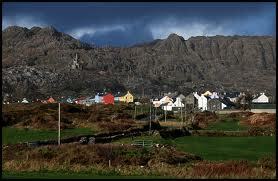 Of course you must be proud to be Irish; so many of my American friends are so very proud of that Irish heritage. It’s a gift, to be certain! I think most nations are proud of their heritage but yes most Irish seem particularly proud. We are losing so much of our history. The small stories from towns and villages are no line being shared. It’s sad to think of how much will soon be lost. This underlines the importance of oral history. It can keep our stories alive. I’m good at passing on our history but not great with our old songs and the stories behind them. Maybe when you hear them you can write them down like you wrote this story. At least they won’t be lost and if you write the words, you might Google and find the stories online. We do gradually lose all these things, sadly. History and songs and tales. I frequently wonder how many absolute gems have disappeared down the ages. Yes agreed but maybe we can use technology in future and save them through you tube etc. I do hope so. I fear it may be too cluttered with useless trivia, though. I really enjoy hearing stories of other countries. I have pictures I’ve created in my mind about what another country would look like and what the people are like. Will I ever cross a HUGE ocean in a tin can to visit? I have some self confidence to build up in me. Thank you for sharing your stories. I think it’s inevitable for things and traditions to change over time, so it’s up to us to continue. Great post, Tric.